Together, during a period of enlargement of 50 years, they have built a zone of stability, democracy and sustainable development whilst maintaining cultural diversity, tolerance and individual freedoms. The European Union is based on the rule of law: everything it does is founded on treaties, voluntarily and democratically agreed by its member countries. The European Union is also governed by the principle of representative democracy, with citizens directly represented at Union level in the European Parliament and Member States represented in the European Council and the Council of the EU. In 2012, the European Union was awarded the Nobel Peace Prize for advancing the causes of peace, reconciliation, democracy and human rights in Europe. One of the EU’s main goals is to promote human rights both internally and around the world. Human dignity, freedom, democracy, equality, the rule of law and respect for human rights: these are the core values of the EU. Since the Lisbon Treaty’s entry in force in 2009, the EU’s Charter of Fundamental Rights brings all these rights together in a single document. The EU’s institutions are legally bound to uphold them, as are EU governments whenever they apply EU law. The Institute for Democracy is a non-governmental organization (Reg. No. 3767 in the Ministry of Justice), supporting democratic processes in the Republic of Moldova, the ideas of the open society, protecting the human rights and fighting the trafficking and violence in any forms. The Institute for Democracy is a member of Anticorruption Alliance of Moldova, Civic Coalition for Free and Fair Elections «Coalition 2007» and «Coalition 2009». On the occasion of the International Human Rights Day in 2016, the Western Regional Association of the UNESCO Clubs awarded the Institute for Democracy for outstanding achievements in the sphere of human rights; International Magazine “Rule of Law” considered the Institute for Democracy the Organization of the Year for outstanding achievements in organizing activities in 2016. 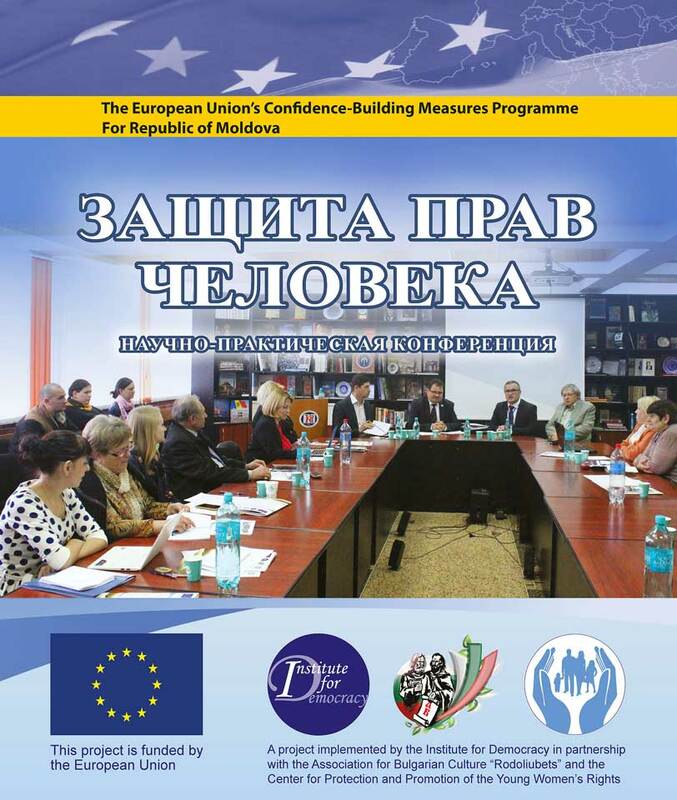 The Institute for Democracy donors: Delegation of the European Union to the Republic of Moldova (2 grants), United Nations Development Programme (6 grants), Oak Foundation (2 grants), Embassy of the Kingdom of the Netherlands (5 grants), United Nations Voluntary Trust Fund for Victims of Trafficking, US Embassy to Moldova (3 grants), Organization for Security and Co-operation in Europe (OSCE), United Nations Entity for Gender Equality and the Empowerment (UN Women), Ministry of the Foreign Affairs of the Czech Republic (2 grants), Office of the United Nations High Commissioner for Human Rights (4 grants), East Europe Foundation, European Endowment for Democracy, Eurasia Foundation (2 grants), UN Optional Protocol on the Prevention of Torture Special Fund, Royal Norwegian Embassy to Romania and Moldova (2 grants), Partnership for Transparency Fund (2 grants), National Endowment for Democracy, Balkan Trust for Democracy (2 grants), United Nations Voluntary Fund on Contemporary Forms of Slavery, UK BEARR Trust, Black Sea Trust for Regional Cooperation and German Marshall Fund of the US, etc. Данный сборник содержит доклады конференции, которая была организована Институтом демократии и Комратским государственным университетом в партнерстве с Обществом болгарской культуры «Родолюбец» и Центром продвижения и защиты прав молодых женщин в рамках проекта «Повышение взаимного доверия между учителями обоих берегов Днестра: Формирование регионального потенциала для непрерывного развития квалификации учителей в сфере современных проактивных методов образования в области прав человека» при финансовой поддержке Европейского Союза (Программа мер по укреплению доверия). Ответственность за его содержание несут исключительно авторы, и оно никоим образом не выражает видения Европейского Союза, а также имплементирующей организации – Института демократии и партнеров проекта – Общества болгарской культуры «Родолюбец» и Центра продвижения и защиты прав молодых женщин. Сборник был подготовлен при содействии Европейского Союза.